Drew Klassen was born in Toronto in 1964,(mis)spent his youth in Winnipeg, and in 1986 enrolled at the Nova Scotia College of Art & Design in Halifax, Nova Scotia. Following his studies at NSCAD, he continued making art while supporting himself by varied means. 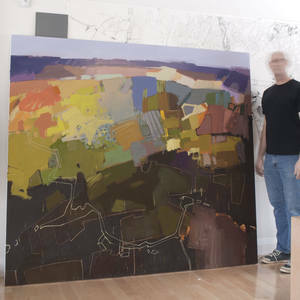 While teaching English in Japan, Klassen began to exhibit his work, and on his return to Canada in 1998 he established a consistent studio practise and began to exhibit regularly in Canada. From 2001—2007 he taught representational methods and theory at the Dalhousie University School of Architecture, and from 2006—2010 he taught painting at the Nova Scotia College of Art and Design. His work is held in numerous private and institutional collections in Canada and abroad. In 2010 he received one of five Established Artist Recognition Awards presented annually by the government of Nova Scotia. He is represented by Parts Gallery in Toronto and Gibson Fine Arts in Calgary. He lives and works in Ottawa.